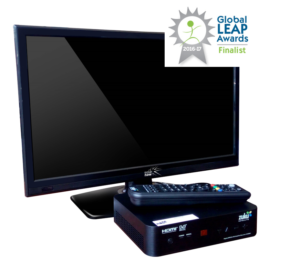 SolarNow has been selected as a finalist of the 20-17 Global LEAP Awards Television and Fan Competitions in the large television category for Outstanding Off-Grid Televisions. The jury has highlighted the balance between brightness and energy efficiency of our 23.6″ TV which provides our customers with an “on grid” viewing experience. This recognition reinforces our strong commitment to transforming our clients lives by offering them the highest quality, energy-efficient off-grid appliances.